One of the scariest dreams I’ve ever had involved dreaming that I woke up and was getting ready to go to school. I went into the bathroom and there was a ghost of a girl that screamed at me so loud it woke me up. I sat there in my bed stunned at how real it seemed. Then I got up and went to the bathroom again and was attacked by a second ghost. This ghost woke me up for real. It was really hard to open the bathroom door that third time. I’ve had that happen before. 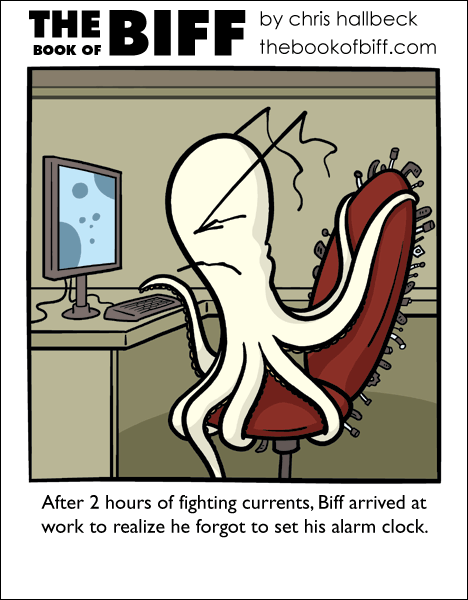 And Octopus-Biff is made of win! I’ve had that happen a couple times. I just kept “waking” up repeatedly. Pretty scary since you don’t really know if this time you’re actually awake. I always have dreams that I wake up at 3PM. It’s alarm clock paranoia. Yeah, I hate those kinda dreams. Best thing you can do is test if you’re awake by trying to do something like levitate out of your bed. My most common dream has to do with alarm clocks. Many nights I’ll dream repeatedly–because I’m constantly checking the time–that I am late. Always late. Usually late to work because I forgot to set my alarm. It is a surprising thing if I don’t have this dream at least weekly. The alarm clock shows a different time each time. I’ve never had that but like Eleanor I did dream through several days of school. It’s stranger in my case because I never realized something was off despite the fact that the auditorium was a swimming pool and the gym court was a series of tunnels and rock edges with malfunctioning gravity. @Zephir You are not alone I haven’t had a dream like this either. Personally I’d be glad to never have one like that too. i never had a dream in a dream. at least not that i can remember. and if theres a girl in my bathroom, ghost or not, I sure would try to jump her. I’ve had a recurring dream where I’m arguing with someone (not sure who the person is, sometimes its my dad, sometimes I don’t even know) and in a very heated shouting match…the reason the argument started is usually a mystery, but whatever it is seems to exponentially piss me off as time goes by, and as I try to scream louder and louder, I make less and less sound, as if I’m being muffled…I usually wake up feeling out of breath, as if I was just sprinting a 100yd dash, and with no clue of wtf just happened. Dreams like that scare me more than demons, monsters, etc. b/c its a perfectly realistic situation until the weird stuff starts happening…and by then youre too far in the dream to know its not real….weird huh? Usually, I’m aware I’m dreaming – though I have had the “wake up” dreams once or twice. Those terrify me when I do wake up. Hey, good tip for this sort of thing. A friend of mine is a lucid dreamer, and she was having issues because she could never tell she was awake. Her doc said if she wanted to know if she was sleeping, just look at her hands. Apparently, while asleep, your brain is incapable of making your hands look and work in a realistic manner. Something about how complex and sensitive they are, your real world hands interfere with your dream hands. Only works if you think to check… but if you check when ever you wake up, you’ll at least know you’re indeed awake and not dreaming. I once had the most wonderful dream where I died, I drowned in 2 seperate dreams, and not having a bad time. Until recently where I was walking on the bottom of some wierd pool, and I couldn’t breath, tried to make it to the other side where there was air, holding my breath, until I woke up, realizing I was holding my breath for real. That was the first time my dreams actually tried to kill me, Freddy Kruger style. The scariest dream I had that I can remember, I had when I was five. I got eaten by a troll. I think if I ever had that nightmare again, it would still be seriously frightening. I had a dream once that was so horrifying I woke up screaming. That was an awesome dream, but then I enjoy nightmares, which leads us to a paradox. Can someone who enjoys nightmares ever have an unpleasant dream? @Soilent: by “jump” to you mean “DO” or do you mean old fashioned jumping people? cause that would be weird if she was in the mens restroom personally. but cool too. as for weird dreams i have this dream where i’m being crucified on a cross. then, before i’m truly dead, they take me off and hang me. Next a girl tries to pour red gatoraide down my throat. *shuddder* nasty stuff. One of my scariest dreams was wjen there was an 8ft skull flying around my house and ironically I was hiding in the bathroom. The worst dreams that I ever have involve the death of my brother, like I’m an FBI investigator or something and I find my brother’s upper torso torn away from the rest of him and a look of terror frozen on his face. But then, I’ve always been protective of my brother. Dreams like what you have Chris are the kind that I intensely want to wake up from. I never have dreams like that, but I do have dreams that frighten me. The worst is this weird dream were everything is normal. I’m always going through my normal day, but then some really tall guy comes along and chases me. He finally catches me and punchs me in the chest. I always wake up at this point, and always feel like I was just punched. Also, any dream I have with spiders in it is garanteed to wake me up screaming. I hate having dreams where I know I’m dreaming. These kinds of dreams always involve something going horribly wrong while I’m running from trouble, swearing at the top of my lungs. There’s a Calvin and Hobbs comic in the same vein as your experience, Chris, except Calvin dreams he falls off a cliff as soon as goes out the door to go to school. That would have scared me so much, Chris. I don’t think it’s wise to write of paranormal experiences in a page for an otherwise light-hearted comic. I actually had a dream where I was going downstairs but then it was actually a computer simulation. That was just weird. Im weird i dont think ive ever had a normal dream that involved normal things. mine are like “Joural’s”, except that im a macabre horror fan/artist so my dreams involve dark creepy places, and monsters that are near indescribable. Though my twisted mind sees these as good dreams not nightmares strangely. Biff finally has enough arms to adjust his chair. my dreams know better than to mess with me. Of course, I do have one that recurs…I like it, cuz I’m a bit of a railfan. I’m at a railroad station when a BIG honkin’ steam locomotive pulls in with a passenger train. Millions and millions of M & M’s pour off the train and head for… wherever. Only, on closer inspection, the M&M’s are actually brightly colored spiders. It varies from there.. sometimes I board the train, sometimes not.. Worst dream I ever had was in high school. I’m walking around and enter this huge room – ceiling had to be a good 20 feet high or so and thousands of thousands of light bulbs. I throw the light switch and they start burning out all over the place. Freaked me out so bad I woke up shouting; likely woke up the whole house when I did. Sometimes I get night terrors where I’ll be walking and suddenly trip, and I’ll wake up as I’m falling. It’s startling enough that my heart races. And when I wake up and start to walk to the kitchen to get a glass of water, and then trip and wake up again, I get really irritated. Heh, I once had a weird, long and complicated dream which inexplicitly ended when I suicided for some strange reason. Woke up feeling like I had been choked. Weird. I’d never suicide, at least not when awake and in a sane state. It’s the return of the office chair! Now with more knobs than ever! I had a dream where I woke up, still lying in my bed, and something opens the door and scares the heck out of me. I hate those “dream within a dream” dreams. What’s weird is that I “wake up”, I’m in my bed, I get up to eat and stuff but there’s this really weird creepy vibe. That’s when I realize I’m dreaming and I “wake up” once more. I go on normally, realize I’m dreaming, etc… I get trapped in there, and although it isn’t dark or there are no monsters or bodies or anything, being trapped in my dream is one of the worst nightmares I have. Also had this dream where I was swimming underwater and couldn’t hold my breath. Turns out I was sleeping face down, on my pillow, and it was suffocating me.